Oil investors were confident ahead of the OPEC meeting last week, holding onto their bullish bets, but now there seems to be a bit of an OPEC hangover after weeks of hype. Heading into the meeting, hedge funds and other money managers increased their bullish bets on crude futures, despite already collectively holding a disproportionately bullish set of positions. The week before the meeting, bets on WTI jumped to their most bullish since February, according to Bloomberg. The shift occurred largely because short bets were liquidated, a sign that investors had fled the scene when they realized that OPEC wasn’t bluffing. “There was definitely a consensus that we were going to see a six- to nine-month extension, so to be short in front of that obviously would not be a good positioning for hedge funds,” Nick Holmes, an analyst at Tortoise Capital Advisors LLC, told Bloomberg. “There was definitely some bullishness that we were going to see a pretty good result out of OPEC, which we did.” Net-long positions on WTI jumped by 15 percent in the week ending on November 28. Even though OPEC signaled its resolve ahead of the meeting, the shift toward bullish bets was somewhat of a surprise given how overstretched on the long side investors appeared to be. 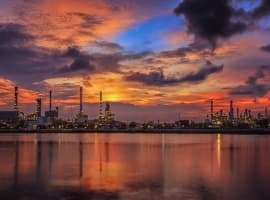 Investment banks such as Citi warned that OPEC could disappoint, and the fact that major oil investors had built up record bullish positions meant that the price correction could have been painful. Nevertheless, investors put their money on OPEC. With that said, spot oil prices did not exactly surge despite the positive outcome. WTI surpassed $58 per barrel the day after the OPEC meeting, but fell back before the close. Since then, however, WTI has dropped significantly, dipping just below $56 per barrel by Wednesday. Goldman cites the shape of the futures curve—the backwardation will continue to steepen, due to higher near-term prices and lower longer-dated prices. The steeper backwardation will induce stronger inventory drawdowns and higher prices for the next year or so, before more shale production starts to drag down prices again into 2019. That's what you get in the most manipulated market in the world. Gonna take a while to shake out the longs and build a new base. LOL! With oil over $60 and WTI just under $60 the bullish price was already priced into the market. Actually over priced into the market because the extension still will do nothing to eliminate the glut of oil sloshing around the world, except to keep a on of readily available capacity sitting. The price being around $60 is also setting the U.S. shell oil industry on fire, and we can expect rapid increases in U.S. production, and there are a few other countries that will also take advantage of this artificially high price to turn up production and the spigot. There really is no reason oil should be higher than $30 to $40, but let Russia and OPEC and the rest of the support industries and market play their game. Let Russia and OPEC let their oil sit in the ground while the U.S. sells it's oil at or near $60. With more production coming on line, and renewables dropping in price and taking a larger share bit by little bit, by the time OPEC/Russia realize they've played a losing game we won't even need all the oil they let sit in the ground.